In 2007, the Canadian company Veresen Inc. applied for a U.S. permit to build a natural gas terminal in Coos Bay, Oregon, and a 229-mile pipeline connecting gas-rich basins in the Interior West to the coast. The proposed pipeline, branching off the existing Ruby Pipeline, raised both job prospects and alarm bells for tribal communities and towns in Oregon, while encouraging export hopes for Colorado, Wyoming and Utah. 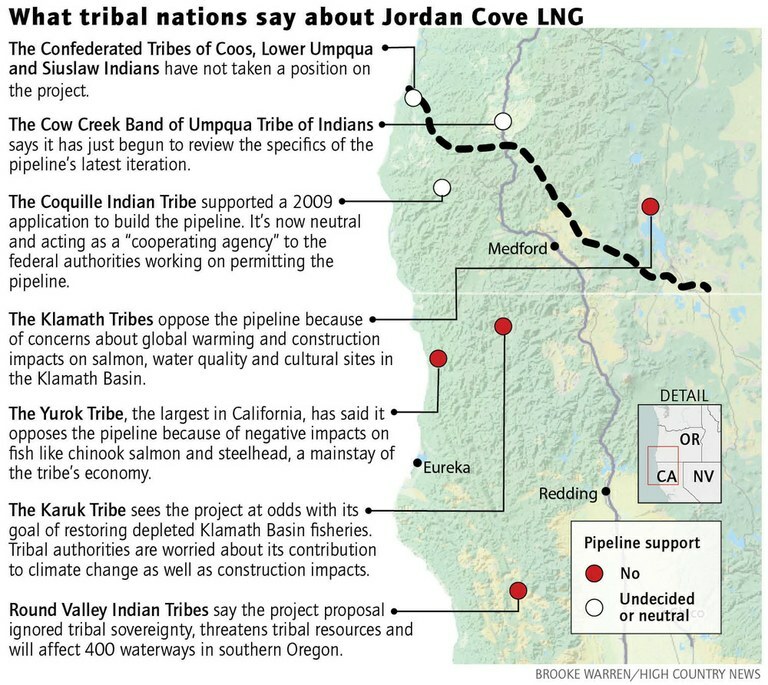 The Obama administration denied the permit several times, but President Donald Trump’s vision of U.S. energy dominance has given the Jordan Cove LNG project another chance. Veresen reapplied last year and is now undergoing the permitting process under a new Federal Energy Regulatory Commission board. This has renewed concerns over the use of eminent domain, as well as construction impacts on ancestral tribal territory, fragile salmon habitat and forestland. While it’s unclear whether FERC will approve the application (it denied a proposed Energy Department coal policy earlier this year, partly because of climate change concerns), Pacific Northwest tribes have been vocal and actively involved, setting the stage for future battles if the pipeline is approved. With the exception of coastal Oregon tribes, who have remained neutral, most tribes near the proposed route are opposed to it.